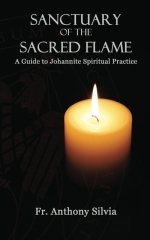 Spiritual practice is essential to the Johannite tradition, and this book will show you how to begin. Using the framework of the Logos Service, the quintessential Johannite practice, you will learn the basic techniques of many different types of prayer, meditation, contemplation, asceticism, and esoteric practice from a Johannite perspective.Whether you attend mass regularly at a Johannite parish, or if you live far from one, you will find a practice or two that will help guide you on the path to Gnosis. The decade meditations and prayers in this practice are designed to recall and contemplate the history of the Order of the Temple from the perspective of the legends of the Johannite Church, from St. John and the Sovereign Pontiff Theoclete, to the Sovereign Pontiff, Dr. Bernard-Raymond Fabre-Palaprat. We hope this practice will become a valuable tool in your spiritual practice, whether you’re a Johannite exploring the Templar current within the Johannite Church, a member of a Templar Order or a solitary practitioner. A must have for student of the Western Mystery Tradition. Available for the first time in English.